HALIFAX, NOVA SCOTIA--(Marketwired - Feb. 16, 2016) - Erdene Resource Development Corp. (TSX:ERD) ("Erdene" or "Company"), is pleased to announce excellent results from preliminary metallurgical testing conducted by Blue Coast Research Ltd. ("BCR") on drill core composites from its wholly-owned Bayan Khundii gold project ("Bayan Khundii") in southwest Mongolia. "From the initial drill results received just two months ago, to these very encouraging metallurgical results, Bayan Khundii is proving to be an exceptional gold discovery when you consider the high-grade, large size potential, proximity to surface, and now high gold recoveries," said Peter Akerley, Erdene's President and CEO. "We have a number of studies underway geared towards a quick ramp-up for this project as we move into Q2 2016." 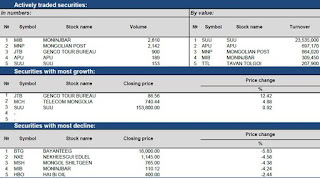 February 16 (Cover Mongolia) SailingStone Capital Partners LLC has filed a notice with the SEC of its holdings in Turquoise Hill Resources Ltd. (NYSE:TRQ, NASDAQ:TRQ, TSX:TRQ) as of December 31, 2015. The filing states the Delaware-registered investment advisor holds 212,933,534 shares in TRQ or 10.6% of total outstanding shares. 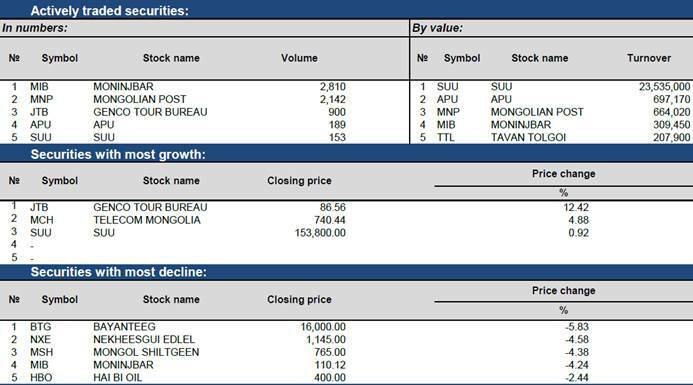 Cover Mongolia previously reported that SailingStone owns 8.5% stake in TRQ as of December 31, 2014. February 15 (Proactive Investors) Xanadu Mines Ltd (ASX:XAM) is the subject of a research report from Bell Potter. The broker retained its Speculative Buy rating and increased its forward valuation of the company. Continued exploration success at Kharmagtai has not only confirmed the likelihood of a major increase to the Resource there but has identified broader and potentially significant other styles of gold-rich mineralisation that further enhances the attraction of the Project. We have revised our equity diluted valuations of XAM to incorporate the enhanced mineralisation potential at Kharmagtai; the reduced terms of the deferred consideration for Kharmagtai; and dilution from a potential raising over the next year although development studies likely to be underway by then could be funded by a major partner. Our 12-month forward valuation is raised by 6% to $0.35/sh. February 16 (Bloomberg) If Mongolia proceeds with its first dollar sale since 2012, it will have to pay almost double what it initially bargained for. The country, which ended investor meetings on Jan. 20, said last summer it was seeking to raise cash at yields below 6 percent. Since then, a combination of slumping commodity prices and political wrangling that led to a no-confidence vote against the prime minister drove the yield on 2022 bonds to 11.90 percent on Monday. February 16 (BoM) On the Foreign Exchange Auction held on February 16th, 2016, the BOM has received buying bid offers of USD and CNY. 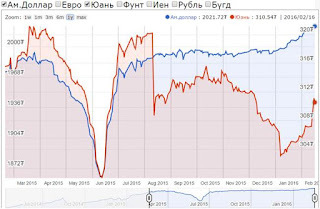 The BOM sold USD 19.3 million in a consistency rate of MNT 2023.20 and CNY 24.0 million in a closing rate of MNT 310.20. On February 16th, 2016, the BOM has received MNT Swap agreement buying bid offers equivalent to USD 99.15 million and USD swap agreement selling bid offers of USD 20.0 million from local commercial banks and the BOM accepted the MNT swap agreement buying bid offers of USD 99.15 million. February 16 (Bloomberg) Mongolia's gross domestic product slowed in 2015 to the weakest pace since 2009, as foreign investment dried up amid protracted disputes with investors, dragging down an economy already battered by weak commodities prices. GDP by production approach expanded 2.3 percent from a year earlier, according to preliminary data posted Tuesday on the National Statistical Office's website. The economy grew 7.8 percent in 2014, following three straight years of double-digit growth. A steep drop in global commodity prices was the largest reason for the slowdown, Tuvshintugs Batdelger, the director of the Ulaanbaatar-based Economic Research Institute, said by phone. Mongolia exported $3.68 billion worth of mineral products in 2015 compared with $4.79 billion a year earlier, according to the NSO, a 23 percent decline. Minerals made up 79 percent of the total exports. Coal led the way down as export revenues declined to $555.9 million from $849 million. The value of Mongolia's copper exports fell to $2.28 billion from $2.57 billion a year earlier, even as volume rose 7.2 percent. Mongolia posted annual growth of as much as 17 percent four years earlier during construction of the initial phase of the Oyu Tolgoi copper mine, a $6.6 billion investment. "FDI plays a big role in the decline of the growth. And FDI has declined because of commodity price declines,' said Tuvshintugs. Foreign investment fell to $232 million in 2015 compared with $381.9 million a year earlier, a 39 percent drop. While FDI reached $4.45 billion in 2012, it has been hindered by a slew of disputes with investors, including a high profile spat with Rio Tinto Group over development of the Oyu Tolgoi mine. The Mongolian government and Rio finally resolved their differences and signed a $4.4 billion project financing package in December, paving the way for a restart of the underground mine construction later this year. Mongolia's 2016 budget includes a 4.1 percent GDP growth projection, according to Manduul Nyamandeleg, head of financial markets and insurance division at the ministry of finance. The World Bank had forecast 2.3 percent growth for 2015, and is predicting a 0.8 percent expansion for 2016 and 3 percent growth in 2017. "Mining production is projected to decline in 2016-17 with lower mineral concentration in ores produced by the OT mine and the weak global commodity market conditions,'' the World Bank wrote its November economic update. While the non-mining sector will probably remain weak, "a recovery in foreign investment in the mining sector is expected to support the industries supplying goods and services needed for large scale mining investment projects in the latter half of the year,'' according to the Bank. Political risk due to "policy inconsistency'' and "political instability'' is also stalling FDI as investors hold their bets, at least until after June Parliamentary elections, said Tuvshintugs. "I don't see a lot of good messages to convince foreign investors to come into the economy. One indication of this is that Mongolian bond prices are now more than 12 percent so that shows you that foreign investors are not buying, they are waiting,'' he said. ULAANBAATAR Feb 16 (Reuters) - Mongolia's economy grew 2.3 percent in 2015, said the National Statistical Office on Tuesday, making it the weakest year since the country suffered delayed effects from the global economic crisis in 2009. Mongolia's economy has fallen being from the fastest growing in the world in 2011 and 2012 -- 17.5 percent and 12.3 percent, respectively -- due to a lack of investors investing in the resource-rich country and slowed growth in its top trading partner and neighbour, China. The stagnant economy sets a daunting challenge for the Democratic Party members, who will be fighting to retain control on the government at an election due on June 29. The growth figure was in line with projections from the World Bank and Asian Development Bank. The International Monetary Fund had projected growth of 4.4 percent. Nick Cousyn, chief operating officer for Ulaanbaatar-based brokerage BDSec, said the slowdown stems from a combination of falling foreign investment, dwindling commodities prices and repeated delays to launching and completing development projects. The government has put off further development of its Tavan Tolgoi coal mine since commercial operations launched in 2011, as well a railway that would deliver coal from the mine to China. "Coal is probably the biggest culprit, and the government's inability to develop the Tavan Tolgoi deposit and the transportation," Cousyn said, adding that shipping by rail was cheaper than by truck, which would cut costs and make its coal more competitive. Mongolia's two largest export products are copper and coal. Growth in the country began to falter when a law passed just before the last parliamentary election, in July 2012, made it hard for foreigners to invest in mining. China, which saw growth fall to its slowest in a quarter decade last year, is also buying up less coal than three years ago, especially for the thermal coal used to power power plants. Mines in Mongolia also produce coking coal, a key ingredient for steelmaking. Coal exports were down 35 percent in 2015 from the year before. Cousyn said growth may return to above 10 percent, "but treadline growth for Mongolia in a normal or optimistic commodities environment is in the 7-9 percent range". 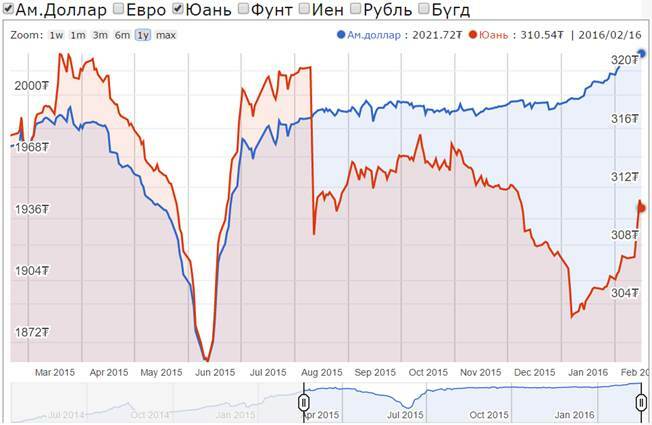 The economy's slowdown will likely be a chief point of attack for the opposition Mongolian People's Party, Cousyn added. "For the Democratic Party to maintain their majority, they're going to have to provide voters with a vision and a plan for future growth," he said. Ulaanbaatar, February 16 (MONTSAME) Average monthly household expenditure stood at 858.6 thousand MNT in the fourth quarter of 2015, indicating a decrease of 130.0 thousand MNT or 13.2 percent compared to the same period of 2014, reports the State Registration and Statistics Agency. This decrease was impacted by a decrease in the expenditure for non-food products and services and other expenses by 102.9 thousand MNT or 14.1 percent. At the same time, an average monthly cash income of a household was 848.8 thousand MNT, going down 123.4 thousand MNT or 12.7 percent against the same period of 2014. This reflected decreases in the income from non-agricultural production and services of 31.6 thousand MNT or 31.6 percent, and in other incomes of 38.3 thousand MNT or 34.1 percent. February 16 (news.mn) The Parliamentary Speaker's Council has made a decision to postpone the opening of the non-regular meeting of Parliament until Thursday, 18th February. The directors of the Mongolian People's Party Group, S.Byambatsogt, and Justice Union, N.Battsereg, failed to come to the meeting of the Council, which had been scheduled today for 09.00 am. The meeting was postponed in the hope that they would come; MPP Group chief S.Byambatsogt finally arrived at the end. Subsequently, the opening of the non-regular meeting has been further postponed; the deadline for covering all the outstanding issues may also be pushed back. February 16 (gogo.mn) According to schedule, the State Great Khural will start at 09:00 AM and discuss the following bills. Yesterday was the State Great Khural's Irregular Session opening but MPP members did not arrive to session hall on basis of ruling party's members were absent. Ulaanbaatar, February 16 (MONTSAME) The cabinet Monday discussed draft amendments to the Law on Government and related to it drafts of law and parliamentary resolutions and decided to submit them to parliament. With the adoption of the Law on State Budget of Mongolia for 2016, the General Authority of State Registration and the National Statistics Office have merged. In this regard, proper amendments have been proposed to the Law on Government and related regulations. The draft amendments outline that Marshall's service and statistics office will be within the authority of the cabinet member in charge of justice. Ulaanbaatar, February 16 (MONTSAME) At its regular meeting on February 15, the cabinet considered the issue of ratifying the 1994 Convention on Nuclear Safety, 1997 Joint Convention on the Safety of Spent Fuel Management and on the Safety of Radioactive Waste Management, 2005 amendments to 1980 Convention on the Physical Protection of Nuclear Material and the Additional Protocol on minor nuclear materials, and decided to consult with some Standing committees. These international documents are in line with the Constitution of Mongolia, the Concept of National Security and other laws and regulations. By joining there Conventions, Mongolia is to sophisticate legal grounds that concern ensuring of nuclear and radioactive safety and protecting people, community and the environment from radioactivity, is to learn from the policies and measures implemented by other countries, and is to promote the international efforts for physical protection of nuclear materials and the combat against nuclear crimes. Ulaanbaatar, February 16 (MONTSAME) The cabinet meeting on Monday amended the rules on origin of goods. This was needed due to the Economic Partnership Agreement's re (EPA) established between the governments of Mongolia and Japan. The rules have been reapproved as an appendix, in accordance with the law on customs tariff and customs tax. Obligations were given to the Minister of Finance and the Minister of Industry to monitor the rules' implementation. Ulaanbaatar, February 16 (MONTSAME) The cabinet on Monday reviewed results of the President's participation in the 46th Annual Meeting of the World Economic Forum held January 19-23 in Davos of Switzerland, and obliged the FM to submit the issue to the National Security Council (NSC). - The cabinet approved a Mongolia-Bulgaria intergovernmental protocol on classifying international contracts, signed January 13 of 2016 in Ulaanbaatar. - The cabinet backed in principle draft amendments to the laws on traffic safety and on administrative responsibilities, formulated by Kh.Temuujin MP. - The cabinet considered a draft amendment to the law on the State Great Khural (parliament), initiated by O.Baasankhuu MP, and decided to pass him some proposals. Ulaanbaatar, February 16 (MONTSAME) At its meeting on Monday, the cabinet fixed a maximum number of people who will complete the equivalent military service this year. Accordingly, this number will be less than 755 nationwide, and a size of payment will be four million 807 thousand and 207 Togrog per person. Obligations were given to the Mayor of Ulaanbaatar, the governors of provinces, the Minister of Defense, and the Minister of Finance to manage the works regarding the equivalent military service and the payment procedure, and to control their realization. The amount of the money has been fixed depending on expenses and services for the troops with term active duty. February 16 (news.mn) Not all the winners of the last "VAT Lottery" have been announced. Yesterday (15th February), the fourth VAT lottery of the year was held; four people won the MNT 4 million, 34 people won MNT 500,000, a total of 335 people received MNT 100,000 and 3171 people won MNT 20,000. But, the winners of the big prizes, namely MNT 20 million, MNT 100 million and MNT 250 million have, for some reason, not yet been revealed. This last lottery has been based on the VAT receipts for the first ten days of February. It will be recalled that the VAT lottery was introduced in 2016 and is held twice monthly. February 16 (Mongolian Economy) It has been a year since the establishment of the Media Council in Mongolia. Over this period, they have brought trainers from abroad and organised trainings. One of such trainers is the Director of the Press Council in Bosnia and Herzegovina, Ljiljana Zurovac, who came to Mongolia for November and December of last year to conduct training sessions and partake in meetings. During that time, we sat down with her to talk about how to correctly develop a media council in Mongolia. She has a wealth of experience and knowledge in media management and self-regulation. - Since the establishment of the Media Council in Mongolia, you have conducted two training events. What are your thoughts on this? - It is an honour for me. It is my fourth time coming to Mongolia. When I came to Mongolia for the first time three years ago, there were some who had expressed a desire to establish a media council. It is a big success now that it has been established and operations have taken off. - How was the situation when you first came here three years ago? - Three years ago, I came to an event organised by the Press Institute of Mongolia with the help of the Friedrich Ebert Foundation. It was the first time when Mongolia media owners, journalists and representatives collaborated to discuss how to establish media management and the need for such a thing. At the time, it was a three-day event. On first two days, programmes were dedicated to media owners and institutions, while the final day was for journalists and involved about 50 people for the organisation. Today, it is a pleasure to see its results. The second time I came to Mongolia, things were a bit different. The operations of professional associations and a press council club were already under way. It was a period when the representatives of major media organisations accepted that a media council would be established in Mongolia. Only a few months after this event, the Media Council was established. The third time I came here was in November 2015. I conducted training for the members of the board of the Media Council and personally participated in the process of handling complaints and petitions received with the two ethics committees of the council. Also during this time, the first-ever open discussion about self-regulation of media was held. - How do you see the future of the Media Council of Mongolia? - I see that the media council of Mongolia is on the right path. I believe the management of the council consists of a strong team that has been recognised by the industry. It has the competitiveness to compete further. I also see that it has solid support from the members of the industry. Of course, there is a lot more work to be done in order for it to spread information about media self-regulation and to develop. I am confident that this team can do what needs to be done and overcome the challenges. The reason is that media self-regulation is not a one-sided thing – it concerns the equal rights of professional journalists, media owners and the public. In other words, it will protect not just the professionals, but also the consumers. Thus, the Media Council is an organisation for media freedom and independence. The council requires both professional and responsible production from the people in the industry. On the other hand, this organisation will protect the interests of the public. - You said that the Media Council will not only protect its industry, but also the public interest. Could you please elaborate on this? February 16 (gogo.mn) Mongolian Ministry of Mining and Japanese Economy, Trade and Industry Ministry mutually agreed to implement project to introduce dry coal preparation technology system in Mongolia. In scope of the project, Nagata Engineering Co., Ltd signed Memorandum of Understanding with the Erdenes Tavan Tolgoi JSC on Aug, 2013. According to the MoU, feasibility study for the "Demonstration Project for Dry Coal Preparation Technology System" was concluded that it is possible to establish trail industry. Therefore, the Ministry of Mining and Japanese New Energy and Industrial Technology Development Organization signed Memorandum of Understanding on establishment of trial industry in Mongolia today. Moreover, agreement to implement the project was signed by the Erdenes Mongol JSC and Nagata Engineering Co., Ltd.
Technology for the trail industry has annual capacity to concentrate 300 thousand tons of coal using dry gravity separation technologies. Background of this Project: Mongolia has plentiful deposits of coking coal, but that coal needs coal preparation to add value to the coal. However, existing coal preparation technologies require large amount of water and heavy medium. Meanwhile, the coal producing region in Mongolia is arid and becomes extremely cold in the winter, so using existing technologies is difficult. Recently, Nagata Engineering proposed to NEDO the application of dry gravity separation technologies that do not use any water for coal preparation as a solution to the issues surrounding the coal preparation in such a region, resulting in the receipt of this contract. Raw coal is separated into clean coal (high grade coal) and refuse (low grade coal) by making use of specific gravity differences, using only powder (medium) and air. In this project, coal preparation will be conducted by combining a fluidized bed separator and air table separator. February 16 (Mongolian Economy) The General Agency for Specialized Investigation granted to companies certificates that provide permission to export raw meat to China. The provinces of Uvs, Zavkhan, Gobi-Altai, Khuvsgul and Bayankhongor were announced to be regions free of hoof-and-mouth disease after experts from China's Inspection and Quarantine Bureau and the General Agency for Specialized Investigation of Mongolia cooperated and conducted inspections to lift the hoof-and-mouth disease sanction imposed on the western and central regions of Mongolia. As a result, China has permitted the "Mon-Tuva" factory of Green Grassland LLC to export cattle, sheep and goat meat from these provinces. The joint working group assembled in Beijing on January 10-16 and signed agreements detailing animal health, veterinary and sanitary conditions, and a protocol of inspection and quarantine of sheep, goat and cattle meat exports from Mongolia to China. The two sides have agreed to issue veterinary certificates for cattle, sheep and goat meat under the protocol,120 of which were submitted to China on January 26. The protocol instructs that meat prepared from the regions free of hoof-and-mouth disease must be imported by designated vehicles through disease free regions. From the disease-free regions, only Gobi-Altai province's Burgastai port borders China, and raw meat and by-products are going to be exported through this port. "To select these companies, we took into consideration whether they meet the required butchering standards and other hygiene requirements," stated Yu. Galsan, Deputy Director of the General Agency for Specialized Investigation of Mongolia, during the meeting. "According to international standards, foreign countries import raw meat after long-term studies and by setting extremely high veterinary, quarantine and sanitary requirements. However, our southern neighbour decided to import the meat in such a short time because Mongolian cattle meat is clean." Currently, these companies have met the meat export requirements, and the number of entities engaged in meat export may rise in the future. February 16 (news.mn) The Economic Transparency Law was introduced in 2015 to provide an opportunity for tax payers for submitting tax declarations which they had hither to withheld. When the law was approved first in August, the deadline for receiving the tax statements was 31st December 2015; however, due to calls from the public, the deadline was extended until 20th February. As of today, only five days remain, after which those people who have failed to submit information on taxable assets and transactions could face full legal penalties. The Economic Transparency Law has proved successful in many respects and has so far generated MNT 14.4 trillion in tax revenue. Also, the Government has provided a special exploration licence to Hong-Kong investor "Mongolia Gladwill Uvs Petroleum", which allowed for a 19,724.28 square kilometer block. Subsequently, the World Mongolia Green NGO considers this is also illegal and there is no recourse except the court. February 16 (gogo.mn) We deliver you the designing of road projects that is expected to be constructed in 2016. 1. Design and drawing of six bridges and road to connect Ard Ayush Avenue located in 30, 31 and 23rd khoroo of Songinohairhan district and Tolgoit road. Project result: To decrease the traffic load of Peace Avenue and Unur town. Infrastructure of ger district located in 1st micro district will be improved and public transportation service will be delivered more closely to citizens. 2. Design and drawings of road and bridges will be constructed in Ger district in Morin davaa to Auto Shopping Complex. Project result: By constructing this road, traffic flow of vehicles travelling from West and North areas to East and South areas will not pass the Ulaanbaatar city center. Also vehicles driving to Auto Shopping Complex from Ulaanbaatar city center will able to go there from Niseh-Songino road. 5. Road and bridge upgrading project from Orbit-Bayangol intersection to Nairamdal camp. Project result: Infrastructure and road safety in Bayangol am, Orbit and Tahilt areas will be improved and the public transport services will be more accessible. 7. Road project to connect Narnii road and Dunjingarav road. Turkish Ambassador welcomes UB Mayor's proposal to establish "Turkish Town"
February 16 (gogo.mn) Today, Mayor of Ulaanbaatar E.Bat-Uul met with the Ambassador of the Republic of Turkey to Mongolia Mr Murat Karagoz. At the meeting, they highlighted the importance of a good preparation in order to make the expected short visit, between April 28 - 30, effective and set specific direction for business delegations to accompany the Mayor. Mr Bat-Uul proposed establishing the "Turkish town and Cultural center in Ulaanbaatar, and requested the Ambassador to allow direct flights from Turkish Airlines that will increase the number of Turkish tourists. Mr Karagoz stated, Turkey is willing to collaborate with Mongolia in dairy and meat industries and notified that the business delegations will be organized upon Ulaanbaatar City's collaboration proposal. February 16 -- In order to know the way forward, it helps to review the past. It was 25 years ago, as the global order changed with the sweeping transitions from plans to markets, that Mongolia joined the World Bank. Within a decade, it was a member of all five institutions that make up the World Bank Group. Mongolia's decision to join the international financial institutions came as old political blocs and economic alliances were crumbling, and a new epoch of globalization was just beginning. For Mongolia, the loss of Soviet aid and the imminent collapse of old trading arrangements led to economic and human hardship. Joining the World Bank meant expanding the range of partners and integrating with the rest of the world. Mongolia was the World Bank's 155th member, part of a wave of additions from the former socialist countries of Central and Eastern Europe and the former Soviet Union. Poland and what was then Czechoslovakia had rejoined after withdrawing years before, and the 15 countries from the former Soviet Union, among others, followed Mongolia to help boost World Bank membership to the current total of 188. The headlines of those 25 years are not hard to determine. We can easily find the sum of the financial flows (more than $800 million) and identify the sectors supported, the social and economic issues analyzed and the technical assistance provided. But headlines don't tell the full story of more than two decades of partnership and collaboration. What have been the impacts and achievements? How has the nature of Mongolia's relationship with the World Bank evolved over that quarter century? What does the future hold? Such questions demand more than a single article or celebratory event. Indeed, understanding how you got to where you are is as important as where you are. With that concept in mind, we will be embarking on a journey of 25 years in 25 days to fully explore the shared history of Mongolia and the World Bank. Starting next week, we will review the key milestones year by year — from the signing of the Articles of Agreement in February 1991 to the signing of the Voluntary Code of Practice on Water Management in February 2016; from the first loan for Economic Rehabilitation to the latest grant on Mainstreaming Social Accountability; from the 1991 report titled Mongolia—Toward a Market Economy to the November 2015 Mongolia Economic Update. In the earliest days, much of the World Bank's support was aimed at helping Mongolia cope with the transition, on survival and rehabilitation—keeping the mines and power plants operational and the coal deliveries on schedule—and on building the rudiments of a private sector and new financial and legal systems. As the years went on, attention to poverty and human development deepened, as did support for rural livelihoods. Citizens were given voice on public expenditure allocations at soum level and below. An early project supported Mongolia's rural infrastructure; a later project helped develop Mongolia's Internet infrastructure. In trying to better understand how the paths of Mongolia and the World Bank supported, reinforced and depended on each other, I have been writing to colleagues who worked in Mongolia for their reminiscences and reflections. Their stories reveal what the World Bank brought to Mongolia, as well as what Mongolia has brought to the World Bank and beyond: lessons and good practices in public financial management that are the envy of many peers in former socialist countries; the world's first index-based livestock insurance system; proof that widespread adoption of solar technology at the household (ger) level is not only feasible but helpful, efficient, and sustainable. How will Mongolia's economy and society develop over the next 25 years? That question raises many more — did anyone foresee in 1991 that Mongolia would be so driven by mining 25 years later? Yet some predictions are as certain today as they were 25 years ago. We know that Mongolia's increasingly educated and sophisticated population will continue to move the country forward. Whether it is in mining governance or education, in environmental protection or crisis response, in herder protection or information and communications technology development, it has been an honor for the World Bank to accompany Mongolia on its development path. The picture description: The representatives headed with the former Minister of Finance A.Bazarkhuu are signing the contract to join as the member of the World Bank, International Financial Corporation, and International Development Association at the building of the World Bank, in Washington on 14th February 1991. Ulaanbaatar, February 16 (MONTSAME) On occasion of the Lunar New Year, the Embassy of Mongolia in Australia has organized a traditional ceremonial event "zolgolt" for the Canberra-residing Mongolians, the Embassy said Monday on its site, adding "the Australians--close friends of Mongolia--were invited". This Embassy, supported by the Mongolians in Australia, participated in annual Canberra Multicultural Festival organized by the ACT Government this February 12-14. Participants of the event were given an opportunity to taste Mongolian food, enjoy the Morikh Khuur play and throat singing, and to see traditional items such as horse saddle and snuff-bottle. Ulaanbaatar, February 16 (MONTSAME) The Embassy of Mongolia in the Czech Republic organized last Saturday a meeting and an event for Mongolian students studying in this country. Co-organized with the "Bayan Mongol" NGO for Mongolian youths in the Czech Republic, the action let the gathered share experiences in how they spend a spare time, as well as ideas about ways of collaborating in some measures of 2016, in promoting Mongolia, and supporting students. Present were representatives of integration center for foreigners in Prague and the Czech University of Technical Sciences. A top Mongolian student in the Czech Republic has been selected as well. Ulaanbaatar, February 16 (MONTSAME) Mongolian team of five cooks have grabbed six silver medals from the 14th International Istanbul Gastronomy Festival, which took place this February 11-14 in Istanbul, Turkey. More than 2,000 chefs from 25 countries participated in this event. The team of master chefs of state D.Buyandelger, R.Batbaatar, J.Otgonpurev, J.Tsagaantsooj and Baigali succeeded in "team Grand Prix" and "Asian cuisine" categories. J.Tsagaantsooj won silver medal in "Asian cuisine" with his Tsuivan (Mongolian steamed noodles with meat) by spinach flour; D.Buyandelger and R.Batbaatar took part in the training of international judges and became licensed international judges. February 16 (MONTSAME) Mongolians broadly use social media. In regard to the start of the Year of the Fire Monkey, social networks were full of posts of best wishes and good omens, pictures of people dressed up in national deel, of tables overstocked with ceremonial meals and of rituals of greeting the mother earth and the golden sun. These images are the vivid indication of Mongolians' renewed respect for the traditions and national heritages and values. You can see that the national costume – Deel – is becoming more stylish while adapting to the modern trends. Deels differ in their sizes of sleeves, collars and lap, depending on the occupations and motions of people who are wearing them. Today, the herdsmen wear deel on daily basis in its original form for their livelihoods, while people from urban areas dress up in fashionable national costumes for special occasions. Young people tend to wear national costumes more often than in previous years. With the taking of Tsagaan Sar over the social networks, contests were underway among people posing for photos with national costumes on. 120 dignity kits with 19 items prepared with total amount of USD12, 070 equal to 24, 370,000MNT and these kits will be distributed in affected communities through NEMA. ULAANBAATAR, Mongolia, 16 February 2016 (UNFPA) - Mongolia is in the middle of a natural disaster. It is not what we normally imagine - an earthquake, flood, or tsunami - but a unique Mongolian disaster where extreme winter conditions and nomadic and agricultural livelihoods intersect: a 'dzud.' A 'dzud' denotes the extreme winter conditions that undermine the welfare and security of herding communities across rural Mongolia as a result of wide-scale losses of livestock. The 2010 dzud resulted in the loss of over 7 million heads of livestock - more than 16% of all livestock in the country - with devastating social and economic consequences for Mongolia's rural communities. A very dry summer in 2015 resulted in low crop yields and over-grazing, meaning that herders were unable to adequately prepare hay for winter months. This was followed by excessive rain and snowfall through the fall and extreme winter temperatures. In one province, soil temperatures reached -50 degrees Celsius in December 2015. According to the State Emergency Commission, as of 18 Jan 2016, 90 soums of 20 aimags are in White-Dzud situation. Animal losses might be increased in Uvs and Zavkhan aimag. As Mongolia faces this winter emergency, it is critical that the needs of women and adolescent girls are met and prioritized. In emergency situations that create financial hardships and displacement, women and girls need basic items to ensure their safety, security and dignity. Without access to culturally appropriate clothing and hygiene items, the mobility of women and girls is restricted and their health is compromised. Preserving dignity is essential to self-esteem and confidence - and critical to protection. As gender-based violence is known to increase in emergency situations, lifesaving items are also needed to help to reduce risk of harassment, abuse and violence. UNFPA developed Dignity Kits to address these urgent needs. UNFPA Mongolia has developed a specific Dignity Kit for the communities affected by 'dzud.' A dignity kit comprises the basic items that women and girls need to protect themselves and maintain hygiene and respect in the face of natural disasters. Kits contain standard hygiene items such as sanitary napkins, hand soap, toothbrush, toothpaste, underwear, and protection items including whistles, lights and etc. Dignity is about more than physical and mental well-being. It is about meeting the basic needs of the women who hold together the fabric of our communities in times of crisis. "Women are the backbone of Mongolian society and we must take concrete steps to ensure their safety and dignity is protected in Dzud situations" says Naomi Kitahara, UNFPA Representative. "Working with the Government of Mongolia to target support to women through the provision of dignity kits will help promote the health and well-being of herding communities across the country." Ulaanbaatar, February 16 (MONTSAME) In frames of its three-phase training for international referees and coaches, the World Rugby carried out the 2nd level workshop for Mongolia this February 11-14 in Ulaanbaatar. Co-organized with the Rugby Federation of Mongolia at the headquarters of Mongolia's National Olympic Committee (MonNOC), the workshop for seven coaches and referees was led by Jin Tong, a tutor and coach at the World Rugby. After the workshop, special quotas were given to G.Dashdendev, N.Enkh-Amgalan and J.Lii to attend a training that gives certificates. Headquartered in Dublin of Ireland, the World Rugby (WR) is the world governing body for the sport of rugby union. World Rugby organises the Rugby World Cup every four years, the sport's most recognised and most profitable competition. It also organises a number of other international rugby competitions, such as the World Rugby Sevens Series, the World Under 20 Championship, and the Pacific Nations Cup. Ulaanbaatar, February 16 (MONTSAME) The cabinet re-designated an amount of road user charges and renewed a regulation on user charges of international and state roads and facilities. Accordingly, passenger cars with 12 or less seats are to pay 1,000 MNT at the posts. Two thous. Togrog will be charged from 12-24 seated vehicles, and MNT 3,000--from vehicles with more than 24 seats. Minister of Road and Transport M.Zorigt was assigned to manage renewing the locations of charge posts and to mark them on the road map of Mongolia. As for commercial vehicles, the user charges will be between 2,000 and 10,000 MNT depending on the truck classifications. February 16 (Conversations with Richard Fidler, ABC Radio) Tim Cope made an epic journey on horseback from Mongolia to Hungary, immersed in the nomad traditions of the Great Eurasian Steppe. After wondering what life would have been like for a young soldier in the army of Genghis Khan, Tim challenged himself to find out. Although a novice rider, he set out on horseback from Mongolia's ancient capital with his dog, Tigon and a caravan of horses. It was ultimately a three year journey across the Steppe to their end-point in Hungary. On The Trail of Ghengis Khan is published by Bloomsbury. February 16 (The Telegraph) After battling freezing temperatures for the Oscar nominated adventure film The Revenant, Leonardo DiCaprio has paid $95,000 (£66,000) for his very own real-life survivalist expedition to Mongolia. He will travel with Johan Ernst Nilson, a Swedish explorer, who has said he will push the 41-year-old actor to his limit. But don't worry too much for his wellbeing during the 10-day journey to Lake Hovsgol. The party will include instructors and a personal chef. DiCaprio secured the trip with his bid at a star-studded charity auction held by the American Foundation for Aids Research last week. Mr Nilson told the New York Post the expedition would include horse riding, hunting with falcons and eating with a nomadic family. They will sleep in a yurt – the traditional domed structure used in Mongolia. "When I do these trips, I take people out of their comfort zone in terms of the inner journey and get them doing things they normally wouldn't do," said Mr Nilson. "If you push your limits, the reward will be much higher. It's going to be amazing." DiCaprio is hotly tipped to win an Oscar for his portrayal of Hugh Glass – a frontiersman left for dead after being mauled by a grizzly bear - in The Revenant. He won a Bafta for the role on Sunday night and is now considered a 1/50 odds-on favourite by Willam Hill for his first Academy Award. He described it as his most physically demanding role, requiring him to struggle through snow and ice, repeating the scenes day after day to get the best lighting conditions. He said: "It was quite possibly the most difficult professional undertaking that I've ever had, and I think I can say the same for everyone that was involved in the movie."